I arranged to meet up with a group of old friends for dinner the night I arrived and one of my mates informed me that I had chosen well as he had been taken to Thai Wi Rat previously by a friend who lived in Bangkok for 3-5 years (the number of years varied slightly over the course of the evening) who told him it was the best, most authentic Thai in Brisbane. First up was a serve of grilled calamari, this was very good and easily passed the not chewy test. It was perhaps not quite as exciting as the stuffed calamari I had enjoyed earlier that day but lovely none the less. Thai Wi Rat use the order at the counter system which I think works quite well for large groups. At least you don't have that 'who pays what' and 'how many beers did you have' problem when the bill arrives. So when I found myself standing at the counter with my mate Gazza we were both keen on the pork neck papaya salad and the pork neck salad (yes they're different) from the specials menu so we decided to go the sharing option. I'm a huge fan of pork neck and reckon if its cooked well its one of the best cuts of pork. 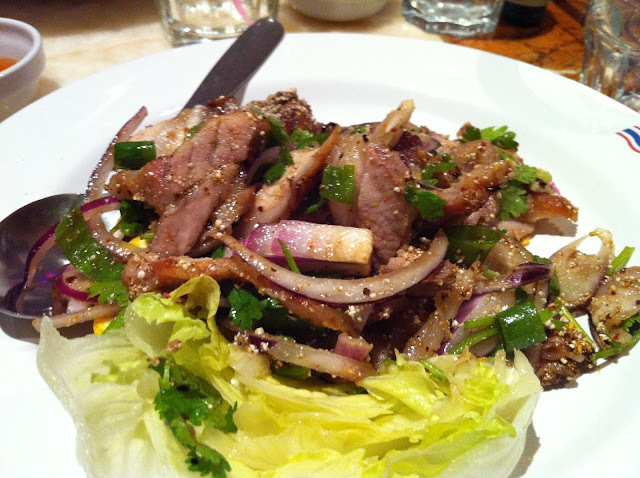 The pork neck salad was one of the simple Isan style meat salads with mostly meat accompanied by some herbs, lettuce and sliced shallots. My guess is that a toasted ground rice is mixed with the meat to give the meat a little texture. Of course a fantastic spicy Thai lime, fish sauce and chilli dressing is added to give that wonderful spicy, sweet, salty zestiness that leaves such a special sensation in your mouth long after you've finished eating. I can't comment too much on the taste of the Pork Neck Som Tam as it was fierily hot, so so spicy that I had to resort to the method of not letting any of it touch my lips while I ate it combined with constantly cooling my mouth with swigs of Singa. Being the proud men that we are, Gazza and I staunchly slowly worked our way through each incredibly painful mouthful enduring the laughs and jeers from our fellow diners until it was all gone and we were left red faced with beads of sweat dripping down our foreheads. 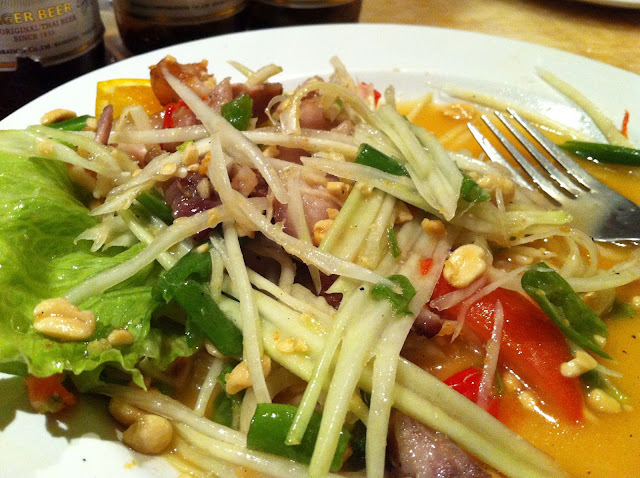 Now I like hot food but this was without doubt the hottest Som Tam I have ever encountered! Not deterred by my painful Som Tam experience a few nights earlier I returned to Thai Wi Rat two nights later to try a few more of their offerings that had taken my fancy on my first visit. Like most foodies I am a bit of a menu analyst, meaning that I think you can tell quite a lot about the quality of a restaurant just by carefully reviewing the meals offered on their menu. In this case the dead giveaway was the Yen Ta Fo noodle soup, if a restaurant has this on the menu then you are almost guaranteed that the food will be very authentic. The Yen Ta Fo was really good, I'm so mad for Boat Noodles that it will always be my number one noodle soup but there are a number of very close challengers and Yen Ta Fo is now one of them. The seafood was perfectly cooked, the noodles were also perfect and the soup was wonderfully tangy and sweet with a balance of saltiness. I ate every last drop and will now be madly searching for somewhere in Melbourne where I can enjoy another bowl. I was pretty hungry that night so I also ordered the Yum Neua Num Tog which is a Laos beef salad. 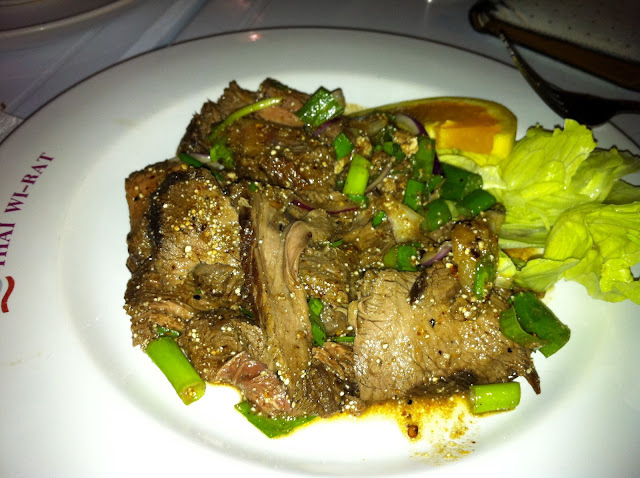 Years ago before I know much about Thai food I was obsessed Thai beef salad and for some reason I have always avoided it these days. This is probably because it is one of those Thai meals that has been adopted by the main stream and you are likely to see a watered down version cooked on Better Homes and Gardens or some similar show. 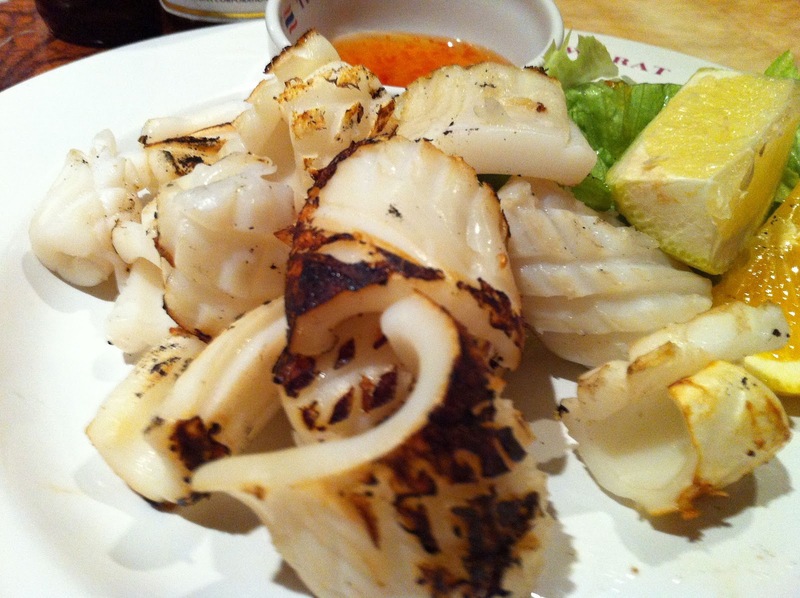 Likewise a lot of Thai restaurants also alter it to cater for the western crowd. Anyway, given that I was convinced that Thai Wi Rat were much more authentic that most Thai restaurants I was pretty confident this would be good. It certainly was, the beef was cooked to about medium. I wouldn't have minded it was a bit rarer but it was very tender and flavoursome and that's the most important thing. Again, I'm pretty sure it was coated with a toasted ground rice powder which adds a lovely texture and flavour to the meat. There isn't much in the way of salad, just a few pieces of morning glory and a bit of lettuce, but I think this is actually how it is served in Thailand. Overall it was a really nice light compliment to the Yen Ta Fo. 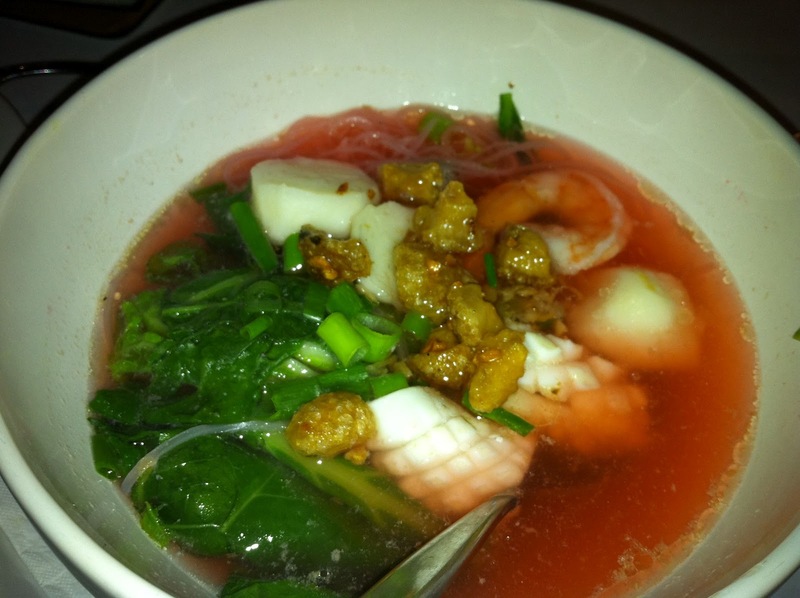 It was also highlighted in a glowing review provided with the menu and I have to agree that this is one of Thai Wi Rat's many standout dishes. So not that I am in any position to judge whether this is the best Thai in Brisbane it certainly is some of the best Thai I have eaten in Australia (sadly I haven't eaten Thai in Sydney... yet). I'll definitely be back next time I'm in town, that's for sure!